We all have stuff. But when it’s time to downsize due to a move or retirement or find a new home for that stuff because of a loss or a death, that “stuff” is commonly known as an estate. Generally, there are three options people face when they need to sell an estate: Auction, a standard estate sale or selling items on their own. Each of these methods has its pros and cons and we hope to give you the knowledge you need to make the right decision if you ever have the need for an estate liquidation. You may think an estate auction is only an option for large estates with extremely rare and valuable items. But a good auctioneer can work with you to find buyers for an estate of virtually any size with items of varying value. When you choose to auction an estate, you select a qualified auction provider to market and sell the items to the highest bidders. One of the biggest advantages of bringing an estate to auction is saving time and peace of mind. As the seller, you know exactly when the action will begin, end and, importantly, when you can expect a check. Auctions also create a sense of excitement and urgency with buyers which can result in higher than expected bid prices. When choosing an auction professional, be sure they have previous experience that is in line with your estate auction project. If possible, try to attend or participate in a current auction that the auction company has going on. This will give you a good idea of their business practices and what to expect if you move forward with them. A reputable auctioneer will fully inform you of your options; such as holding an on-site estate auction or moving the auction to a separate facility. The auction company will give you a formal proposal for the project that will include all fees or commission rates. Since most auctions are different and have a lot of variables, there is not a standard fee for every auction. However, you can typically expect a commission rate based on the total amount of assets sold and/or some kind of flat fee structure. If the auction isn’t held onsite, be aware that moving items to another location can be time consuming and expensive. If it’s necessary, try to arrange this transportation yourself, if possible, to save a few dollars. Auctions are not without their disadvantages. It can be scary to put your faith in the open market when it comes to the valuation of your items. Regardless of how much sentimental value your items may have, the only number that matters is what the buyer is willing to pay right now, in cash. For any items that remain after the auction, many providers will work with you to ensure any unsold items are donated or properly disposed of. Another popular option are estate sales, but they too have their advantages and disadvantages. During an estate sale, you hire a company or individual to price each item then market and administer the sale. Estate sale companies typically take set-up fees plus commission based on final sale totals. Once you specify what’s for sale, the company takes care of the rest with little to no involvement from you. And if there are rare or specialized items, the company can reach out to and market specifically to collectors. Most estate sale companies have a minimum and won’t handle a sale if the worth of the goods doesn’t meet that designated minimum amount. At the end of an estate sale, you will receive your portion of the proceeds after the company takes its commission. You will also be responsible for selling or donating any remaining items that did not sell. No one can guarantee that any or all items will be sold at the end of an estate sale. The success of each sale is dependent on how items were priced, how the sale was marketed and if the right buyers showed up during the sale. Also, while most states require auctioneers to be licensed, there are no licensing requirements for estate sale professionals. Lastly, if you’re ready to do it yourself, a garage or tag sale might be an option for you. When you hold a garage or tag sale, you’re in charge of everything – you display and price your items, you market and manage the sale and you take care of whatever is left over that was not sold. Garage sales typically operate on the model that items are priced low and often sell at or below the price listed. Widely marketing a garage sale can be difficult and competition for buyers is often strong, depending on the popularity of garage or tag sales in your area. During a garage or tag sale, you are responsible for collecting all payments and assume any risk associated with handling cash or accepting checks or credit cards. Most garage/tag sales are cash only, but that can limit the number of buyers since many people do not carry cash. As you can see, when you have an estate you need to handle, you have a variety of options -- from full-service auctions designed to return top dollar to DIY garage sales. If you are considering an estate sale or auction, visit this page for more information on using K-BID and all the options to fit your unique situation. We’re here to help! When most people think of online auctions, they think about eBay or the penny auction sites advertised on TV. However, online auctions are quickly becoming the preferred method for companies and individuals to liquidate assets and there’s a whole world of auctions to explore. That means bidders have a nearly endless opportunity to find great deals, but only if they know what to look for (and have a few insider secrets). Not all auction sites are created equal and each site has different rules. We know terms and conditions pages can be long, but it really is important to read them to ensure you know what you’re committing to when you place a bid. Many online auction companies provide the opportunity to inspect items in person before the auction ends. If you’re nearby and truly interested in an item (or items), be sure to take advantage of this time. You are ultimately determining the value of an asset. Have questions about any items or how an auction works? Contact the auctioneer. Most are readily available and happy to answer any questions about items or process. If you still have questions, contact the company managing the sale. If you can’t afford it, don’t bid on it. Recognize your budget and stick to it. Because once you’ve committed, it’s yours and you’re paying for it. We’ve lost count of the number of times something like this has happened – guy bids on and wins brand new camper, brings it home and the purchase is quickly nixed by his wife. If you’re making a major purchase, be sure to include your significant other in the process. You don’t really want to have to turn around and sell it right away, do you? Never assume an auctioneer can ship an item. Before bidding, check to see what shipping options are provided. If shipping is available, talk with the auctioneer about costs so you can figure that into your budget. An auctioneer’s goal is to move merchandise and they aren’t going to hold onto it for long. Find out when the removal date is, if shipping is involved and what, if any, equipment you may need in order to remove an item (or items). You’ll save a lot of chaos, confusion and headaches if you have a plan in place before you remove your item. Check the history of the company from whom you’re buying. Have they been in business for awhile? Do they have reviews, testimonials or a social media presence that can provide some insight? If you can’t find information on the company or they have worrying reviews, you may want to think twice before bidding. Auctioneers are human and make mistakes too. Not all issues are fraud. Before you claim fraud, attempt to work with the company to fix the issue. Many people believe they’re completely anonymous online and that their actions won’t be tracked back to them. If you’re placing bids on any auction website, be sure to stand behind your actions and what you’ve bid on. How do we know all this stuff? Through the years we have been fortunate enough to see thousands of auctions on K-BID.com. We realize that not everyone is familiar with online auctions so we try to make the experience as easy and user-friendly as possible. Our goal is to help you find great auctions and keep you coming back for more each day! Check out some of the current auctions on K-BID.com or visit our bidder knowledge base if you have questions about how to bid on our online auctions. Check the Vehicle Identification Number (VIN) and invest in a Carfax vehicle history report (or a report from a similar service). You’ll learn about the history of the car and its past owner(s). Checking the car’s year, make, model and condition using an online resource such as Kelly Blue Book will help give you an accurate idea of the resale value of the car. If you do decide to bid on the vehicle, you’ll have a realistic bidding range to stay within. A description of a vehicle might state it’s in good condition, but you need to carefully inspect every inch of it yourself in person before placing a bid, if possible. Look for a new paint job, warped metal, leaking fluids, wet interior, strange smells and even check inside the glove box. Leave no stone unturned and no tire un-kicked. If you’re allowed to drive the car before bidding, do it. The auctioneer doesn’t always have a complete history of the vehicle or know its current condition. Make sure that you are doing your own homework to determine the value. When it comes to your mechanical prowess (or lack thereof), it’s important to be honest and acknowledge if you truly do know the cost of replacement parts and if, once you’ve got those parts, you know what to do with them. 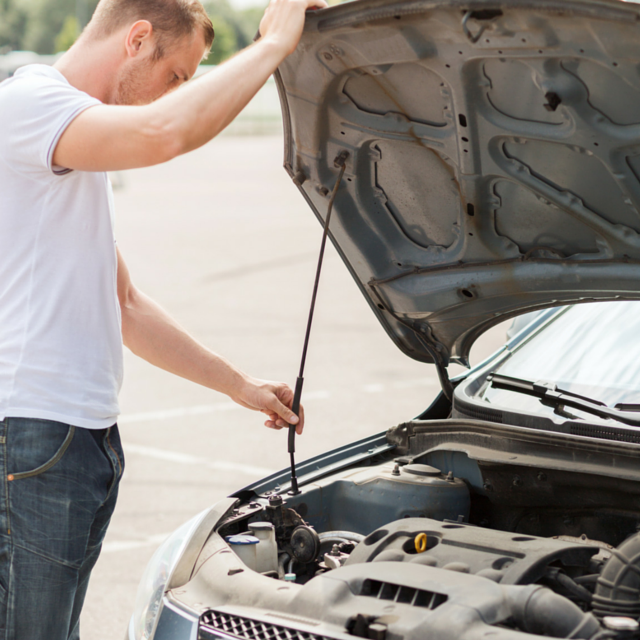 If you aren’t an experienced do-it-yourself mechanic, buying a vehicle at auction can mean expensive repairs by a professional. If a vehicle is listed “as is,” it means exactly that. After you’ve fully inspected the vehicle(s) you’re interested in, set a maximum bid limit for yourself. If you think you might get caught up in the excitement of an in-person auction, bring a trusted friend who can stop you when you hit your limit. If the auction is online, write down your final bid and keep the paper next to your screen. Don’t allow yourself to go over that written limit. If the bidding continues once you’ve reached your limit – stop. You chose that number for a reason – either the car isn’t worth what someone else is willing to pay for it or your budget can’t handle the strain. Read all available information (or talk with the auction representative) to get to know the rules of the auction. Be sure you’re familiar with any taxes/fees and if you need cash, a credit card or an approved loan if you’re the winning bidder. If you’re unsure of the process or have a question, ask the auctioneer or auction company. If you are participating in an online auction and purchase a car in a different city or state, be sure to get shipping details and figure in shipping fees. If you bid at an in-person auction, you’ve already done your homework to find out if the car is drivable, right?